Pets complete a home for single people and families. Children often desire pets more than adults do as they think animals are cute and fun to have. Adults of course know the work required. Like any pet, rabbits need care. They need to go to the vet, get feed daily, and have their domain cleaned. When you decide to purchase a rabbit, you will need to know exactly what is required of you. Before we get into your rabbits needs, you will want to know a few of the species available. Most common are cottontails, dwarf, and lop eared rabbits for pets. The dwarf rabbit is small and best kept indoors, while the cottontails are not as sensitive to the weather and can be housed outside in moderate climates. The lop eared rabbits like the cottontails grow to be a good size and have long floppy ears. The type of rabbit you wish to have for a pet will in part decide on the care. First like cats and dogs, rabbits require shots from the vet to keep them in good health. People carry diseases that can harm animals if we do not wash before and after we handle our pet. Rabbits can be susceptible to worms and other dietary parasites so it is important to take your rabbit for its vet visit when needed. Speak with a vet about your rabbit's care and any questions you may have before you complete your purchase. Rabbits eat pellets, hay and vegetables. Most rabbits like to munch on carrots or lettuce. You want to feed your rabbit everyday to ensure they are receiving the proper amount of food. Unlike cats that eat when they are hungry, a rabbit can over eat and become over weight. Some commercial feeds for rabbits contain nuts; however, these are typically not good as they are high in fiber. You can feed your rabbit fruit as a treat, but you should not do so daily. Housing for a rabbit can be in your home or if you wish to keep them outside a wooden cage will work. Most outside cages are designed to let the waste fall through so they are not sitting on it or laying on it. The cage should be built large enough to house an adult rabbit with bedding spread out to make a nice little home. They should be given plenty of water and have it changed out daily. Having a backyard for your pet rabbit is a great idea. They can roam for a little exercise, which all pets need. You will want to clean their cages out at least once a week or more depending on how messy or smelly it becomes. Your rabbit needs a clean environment just like you to eliminate the possibilities of disease. An important factor in having a long living rabbit is their environment. Most rabbits live 5 to 10 years. Rabbits with their fuzzy cottontails or floppy ears are just some of the cutest pets you can own. 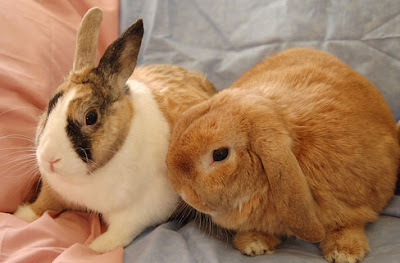 They are a medium maintenance pet with proper feeding and environment care you can have your rabbit for years. Your children will enjoy showing off their pet rabbit to all their friends and beg you to take him to show and tell. Pets are needed to complete a family and provide enjoyment for everyone.